When you stay at Pousada Vila Itaqui in Luis Correia, you'll be on the beach and steps from Coqueiro Beach. Featured amenities include multilingual staff and luggage storage. Free self parking is available onsite. 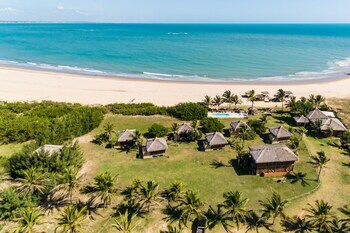 With a stay at Plattinum Hotel in Salvador (Itapua), you'll be steps from Itapua Beach and 14 minutes by foot from Piata Beach. When you stay at this apartment in Guaruja, you'll be near the beach and 13 minutes by foot from Enseada Beach. Free self parking is available onsite.